Sound & Audio file converter for mac for various formats to meet diversified needs. Extract audios from any video file to make favorite music. Perfect audio CD Converter to copy CDs and create quality audio files. Terrific music CD, MP3 CD and WMA CD maker. 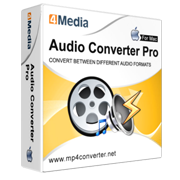 Get the all-round audio-converting solution with 4Media Audio Converter Pro for Mac! Incredible comprehensive, this professional audio converter for mac tool satisfies you with every need to create quality music files by converting between different audio formats, extract wanted audios from standard videos as well as High Definition videos, convert from audio CDs and burn first-class music CD, MP3 CD and WMA CD. Not merely an audio file convertor for mac, this program also enables you to customize and perfect your output music by providing segment clipping function, effect-appending feature and many other facilitated elements. Support exporting output directly to devices like iPod, iPad, iPhone and PSP for great convenience. 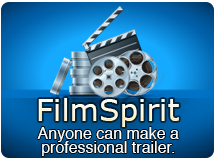 Free Convert video and sound files on mac between various formats like MP3, WMA, WAV, AAC, FLAC, OGG, APE for meeting diversified needs. Extract wanted music from videos in any format no matter standard videos or High Definition videos. Burn your favorite music into quality music CD, MP3 CD or WMA CD with ease for Mac users. Convert Audio CD in fast speed to create terrific music and enjoy anywhere. Support exporting output directly to devices like iPod, iPad, iPhone and PSP for great convenience. Retrieve CD detailed information like Artist, Genre, Album and Year when loading a CD disc.